Media dis&dat: Switzerland to vote on whether to stop people from traveling to Zurich for "suicide tourism"
Switzerland to vote on whether to stop people from traveling to Zurich for "suicide tourism"
Switzerland is holding a referendum on whether to stop people travelling to Zurich to take part in "suicide tourism" - so how would a "no" vote affect the assisted dying debate in the UK? Voters will decide on two referendum proposals: one to ban the practice altogether, and the other to limit it to residents of Zurich only. So far, some 150 Britons have ended their lives at the Dignitas clinic in the city, among them Dr Anne Turner (pictured). Her daughter, Sophie Pandit, 46, took her to the clinic for an assisted death in January 2006. Dr Turner, 66, was determined to end her life after being diagnosed with the degenerative neurological disease PSP. She had watched her husband die an "awful death" from a similar condition. "If she had not had this option there is no doubt she would have tried to do something herself," says Mrs Pandit. Mrs Pandit hopes a "residents-only" vote in the referendum would result in a positive change in the UK. "It will put pressure on politicians to talk about this issue and stop being so cowardly about it," she says. "We need a debate, concentrate on that, not keep farming out the responsibility to Dignitas, where only people who can afford it can go," she adds. Pro-assisted dying campaigners say the number of people travelling to the Dignitas clinic proves there is a demand. Campaign group Dignity in Dying, of which Mrs Pandit is a patron, agrees Dignitas acts as a "pressure valve", meaning the UK government currently does not have to address the issue. It is calling for a change in law to allow adults who are mentally competent the choice of an assisted death - within strict safeguards. "British people who are dying shouldn't have to travel 500 miles to have a death which they consider to be dignified," chief executive Sarah Wootton says. It believes the number of people using Dignitas is just the tip of the iceberg - with many others asking doctors or family to help, or taking their own lives. "It is happening but very much underground, behind closed doors, there's not an open discussion of that with friends, family and health professionals," Ms Wootton adds. The campaigners say if people can no longer travel to Zurich, they will simply end their lives in the UK. When Dr Turner's family tried to dissuade her from the idea of assisted dying she tried to kill herself at home. "It was then we realised she was serious and we should take her seriously, we should respect her wishes and it was selfish of us to want her to live in any circumstance," Mrs Pandit says. "If we couldn't have gone to Dignitas she would have tried really hard to persuade one of us to get someone to physically kill her or she would have tried to do it herself again and probably end up in a worse state than she was in - that would have been horrific. "We are not looking at choice of life and death, but suffering or a quick and painless death." 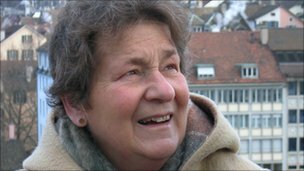 But the anti-euthanasia alliance Care Not Killing said it would welcome a "no vote" in Switzerland. It opposes any change to UK law as it says it would not provide enough protection for vulnerable patients. "People travelling to Dignitas don't seem to be properly assessed so many patients are not terminally ill, some are psychologically unwell - they are not the sort of people we feel should have assisted suicide," chairman Dr John Wiles says. It says legalising assisted suicide would send the wrong message to terminally-ill people. "People do feel vulnerable and do feel like they are being a burden. We should provide better care at the end of life," he adds.